Cecrops, a half man and half snacks creature, created a beautiful city called Cecropia on the top of the hill. He managed the city well. The city became a well-know city soon. Gods knew that were felt not happy. Because the city’s economic was very flourishing but Cecrops didn’t pay any tribute to them. So they decided the city should be named after one of them and this god will become patron god of the city. But use whose name? The gods had several heated debates over which one of them the city should be named for. 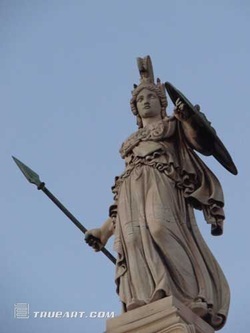 At last Poseidon, the god of the sea, and Athena, the goddess of wisdom, became the primary contenders. They both pleaded with Zeus to become the patron deity of Cecropia. Zeus decided that both gods would present King Cecrops and his citizens with a gift. And the citizens chose whose gift then who will become the city’s patron god. At last Poseidon’s gift was a fountain. He told to citizens the water will never dried-up. But citizens found that the water was seawater. It can’t drink and it wouldn’t help their crops. Athens’s gift was olive trees. She told to citizens if they chose her, she will plant these trees all throughout the region. Because citizens found that olive can eat and the tree also can make many things. So they chose Athens. At last Athens became this city’s name.